With some grim humour I always answered the question about how long a tattoo would last by saying: “They are guaranteed for life – and six months.” – Samuel Steward, tattooist and author of Bad Boys and Tough Tattoos (1950-65). This website is dedicated to my research into the postmortem preservation of tattooed human skin. My research in this field began in 2009, with my doctoral work on a collection of 300 dry-preserved tattooed skins owned by the Wellcome Collection in London. This project explored the historical practice of collecting and preserving tattoos, the origins, purpose and materiality of the collection, and the iconography of the tattoos. 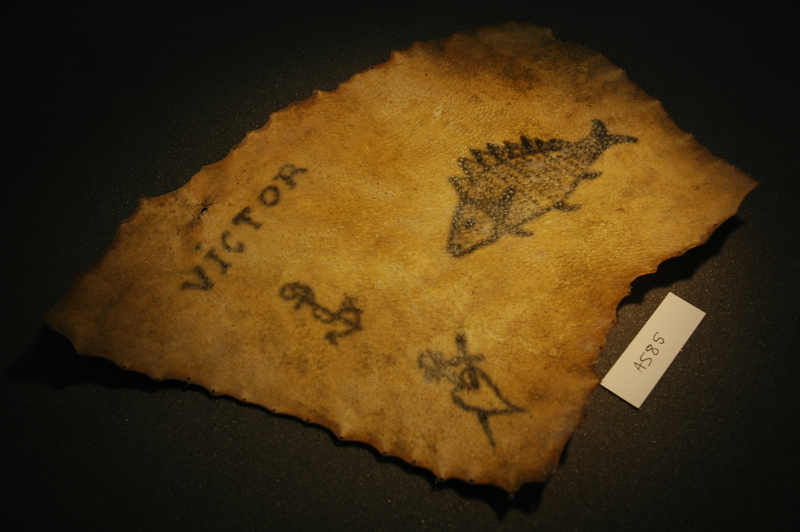 Having completed my PhD in December 2013, I continue to work with collections of preserved tattoos across the world. My research has taken me to some unexpected places over the past 7 years – sometimes bizarre, always fascinating – some of which is documented in these pages. Here you will find my reflections on the research process, covering a wide range of related themes and issues, from the problems inherent in working with museum collections of human remains, to the growing contemporary interest in postmortem tattoo preservation by living donors, and much more besides.